Jodee Parsons and McKenna Tait aren’t going for the gold this year. The two girls who’ve been knee-deep in Family, Career and Community Leaders of America (FCCLA) at CHS the past four years want to be the top gold medalist in their event when they compete at state next week. Being top gold medalist in their category means they qualify to compete at nationals. Parsons and Tait aren’t the only state qualifiers this year who have their eye on top gold. Chanute High School seniors Jaylynn Hicks and Harlee Johnson will also by vying for top honors. It’s an extremely competitive event. The students will compete against 1,500 others who also earned medals at district, said FCCLA sponsor Leah Hoesli. If they finish with a top gold, they will qualify for nationals where 6,000 FCCLA students will compete. Qualifying for the trip to Wichita April 8-9 are Parsons and Tait with their Chapter in Review project; Hicks in Job Interview; Johnson in Recycle and Redesign; and sophomores, Blair Curtis and Aaron Rodriquez, who teamed up to compete in Life Event Planning. Parsons and Tait believe that the knowledge and experience they’ve gained the past four years gives them an edge over the competition at Wichita. Yet that is just one of their goals. They also want to put the local FCCLA chapter on the map at CHS. “Our club is kind of unknown. Nobody really knows how much we do or what we can do,” Parsons said. 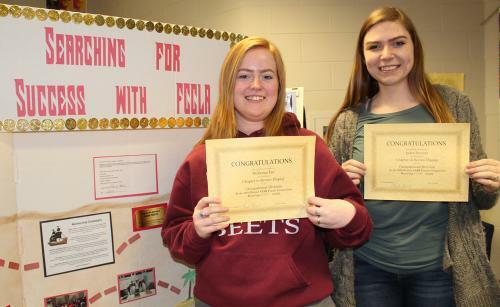 With Parsons as chapter president this year and Tait as vice president of membership, the pair planned fundraisers and community activities to raise awareness of FCCLA in the school and the community. They called their planning process the FCCLA scientific method where they identify concerns, set goals, formulate a plan, achieve a goal, act and follow up. “One of the things we decided at the beginning of the year when the officers got together and planned was to hold one event every month,” Parsons said. Documenting all the events is part of their Chapter in Review project to be judged at state. The girls have to provide the chapter budget and compare it with the actual costs, talk about their events and their fundraising. Most of the points will be based on their 15-minute speech, where they talk about their fundraisers, Rush Week, the trick or treat for kids, the Kids Cooking Class, and the Egg Your Yard event. They also get graded on their visual display, a treasure map on a board with the theme “Uncover the Clues with FCCLA,” and how well they answer the judge’s questions. Senior Jaylynn Hicks is competing in her first STAR event (Students Taking Action with Recognition) in the Job Interview category. “This STAR event fit her perfectly,” Hoesli said. Hicks said she was more nervous about competing in a STAR event than she was in her job interview. “I was surprised I did so good,” Hicks said. 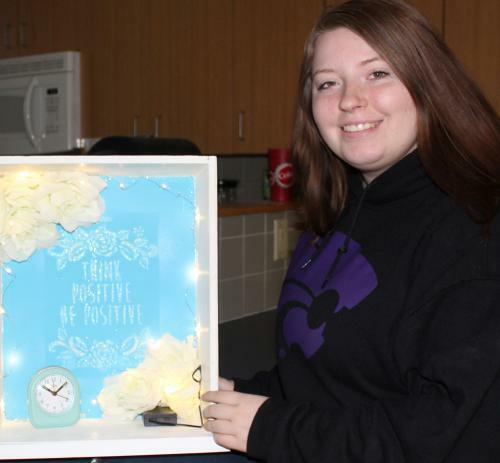 “I have to fix my resume and make sure the templates are all the same and reference my binder more when I’m talking,” the judges told her at district. “The career I chose was early childhood education and the job I chose was a kindergarten teacher,” she said. Her current experiences, being a study buddy for the younger students at Cherry Street, and a lifeguard during the summer, makes her a good candidate. Besides completing a binder for the judges that incudes her experience, letters of recommendation from teachers and an employer, she also participates in a mock interview. “(At district) they basically asked me questions about my strengths and weaknesses (and) what qualities I have that other people don’t have. It was hard for me to go in and answer questions about myself,” she said. Countless hours go into STAR events. “We started before Christmas break, and on days off we came in,” Hicks said. “When we didn’t have school, the girls came in and we worked on their events,” Hoesli explained. 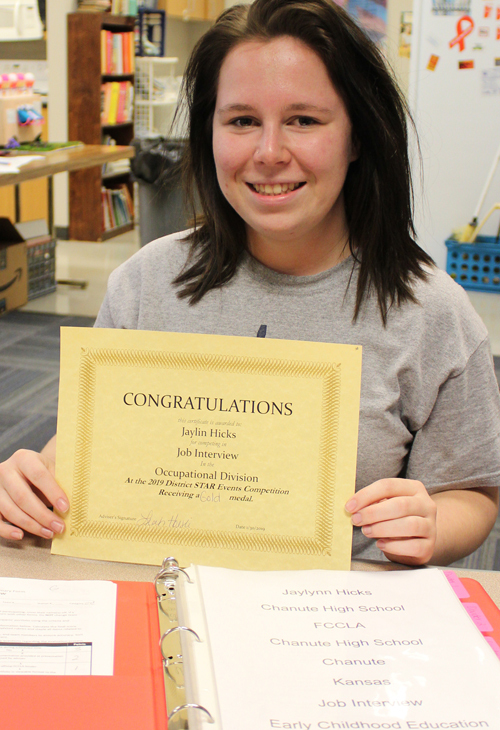 Senior Harlee Johnson had already competed in Chapter in Review, Chapter Service and Life Event Planning in FFA. She started looking at Pinterest for ideas and found a dresser drawer turned into a shelf. ”I thought I could incorporate it into my dorm room,” she said. She completed a sample and put photos of the process on her display board. State is the big one where you want to put in all your effort, she said. Her plan is to have a board made where she could hang the examples of her Vintage Dresser Redo. Sophomores Blair Curtis and Aaron Rodriquez planned a senior citizen prom for their first Life Event Planning. They had to plan an event, budget and comparison shop, and create a binder showing what they did, Hoesli said. The two talked with the director of Country Place about their idea. Once it was approved, they met again to work out the details for what they would provide, what the home would take care of, as well as the rules of the senior care center and what they could not do. They hung up flyers inviting family members and the residents to attend. The district judges said “we needed to work on our speech,” Curtis said. “To slow down because we have time,” Rodriquez added. “They are first-year sophomores. They have a lot of work to do but they are learning a lot,” Hoesli said. “They are both running for a district office and could be future leaders,” she added.